Open your child’s heart to the beauty of the world, animals, and people as we fly with Angel Bear and Sweet Pea. As we fly around the world we will learn who we are as we stretch our bodies and explore nature singing, counting, reading, writing, drawing, laughing, and playing all the way! Calm Cottontail lives in a peaceful garden and is a wonderful role model of calmness through the appreciation of nature. With a live bunny, this will inspire your child to blossom and grow peacefully. 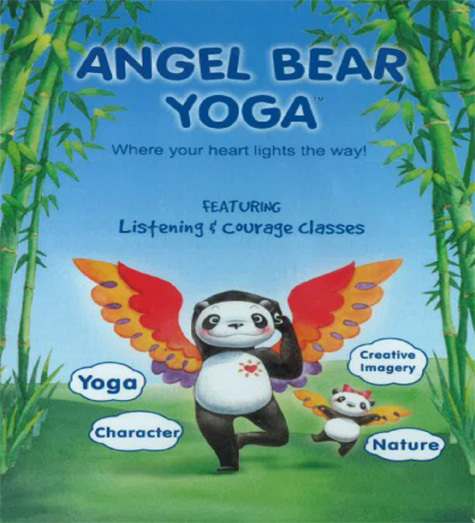 Angel Bear Yoga™ is very superb program for children 3-10 yrs. It is very sought out on the East Coast. I feel gratitude to introduce it in my Eco Kidz Studio here in Bend Oregon! Family’s and children are already jazzed about to hear about such an amazing place. Step inside and you’ll see for yourself! Angel Bear Yoga™ offers a different approach for kids yoga. By tapping into the every child’s fascination with the world around them, Angel Bear Yoga has developed a kids yoga program that entertains, engages and teaches children basic yoga principles. Taking to heart our mantra to open children’s hearts one pose at a time. It’s a creative way to get children involved in imagery with a strong connection to different animals. We have fantastic trained yoga teacher’s for this essential program.